Key stakeholders that influence our business activities are highly diverse. We value stakeholder engagement because we believe communicating with our stakeholders is important for understanding social issues, building relationships of trust and collaboration, and accomplishing greater results. One of our key strengths defined as approaches to the material issues is "Promoting the development of advanced human skills by fostering partnerships with stakeholders representative of broad sectors of civil society." Customers As stated in the Group Management Philosophy, carefully consider the interests of our customers when making decisions, and contribute to the security, health, and wellbeing of our customers and society as a whole by providing insurance and related services of the highest quality possible. 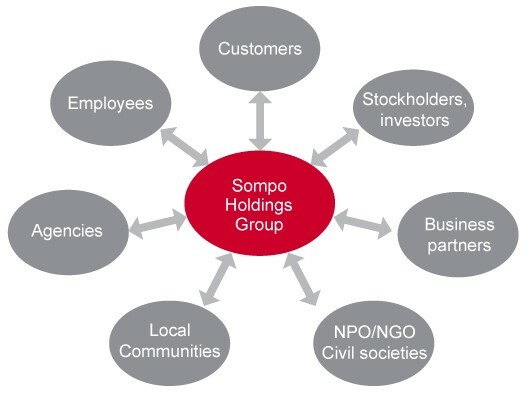 Stockholders, investors Through the timely and appropriate disclosure of information, we aim to ensure that shareholders and investors have a suitable understanding of the Group’s business conditions and status of each initiative. We also make use of input received through constructive dialogue with shareholders and investors in order to promote sustainable growth and increase corporate value. Business partners Conduct fair and equitable business with partners (suppliers, companies we invest in), observe legislation and regulations, and collaborate with them to address social issues. Civil societies Work to address social issues and promote projects and education through partnerships with civil society organization. Local communities Aim to address local social issues through group-wide initiatives as well as voluntary efforts by individual employees. Agencies Strive to provide appropriate advice and adequate service to satisfy customers, and make an effort to consider the environment and local communities through collaboration between agencies and employees. Employees Conduct capacity building and exchange programs across the Group, emphasizing action and achievement, impartiality and fairness, openness, and diversity as stated in the Group Personnel Vision. We engage with stakeholders with two main objectives: The first is to incorporate stakeholders’ ideas and opinions into Group decision-making so that we can innovatively improve the quality of our initiatives. The second is to actively pursue deeper levels of understanding and collaboration with our stakeholders so that based on shared values we can take action toward a better society. Continued engagement informs and influences the identification of our material issues and setting of our CSR-KPIs. Through such engagement, we work to deliver products and services that help address social issues while revising and improving our initiatives.